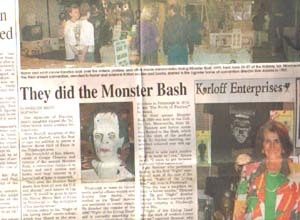 The 1998 Monster Bash featured Guests of Honor Sara Karloff, Dwight D. Frye, Carla Lammle, Forrest J Ackerman, Tom Savini, David Skal, Monster Bash make-up artist Ron Chamberlain and many more. It was a tribute to Boris Karloff this year. 30 years after his passing - Karloff was not forgotten! 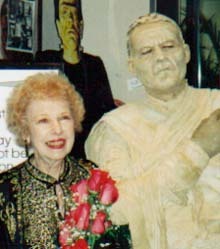 Our events included the a giant Karloff celebration on Saturday night with Karloff Kake after a standing room only talk with Sara Karloff. 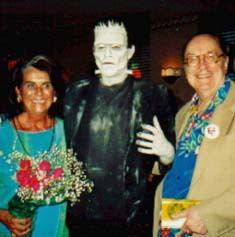 David Skal, producer of the Classic Horror Universal DVDs, premiered his documentary that would appear on the DVD later in the year. A showing, in 3D, of a rare Frankenstein short from the 1940's called THIRD DIMENSIONAL MURDER. 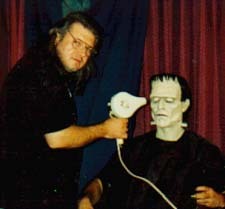 Plus, an uncut showing of the original film FRANKENSTEIN, produced by Thomas Edison in 1910 and thought lost for years. It was a heck of a great time. After Bash '99 front page newspaper story! with his creation (Frank Rios)! Monster Bash Dealer Dungeon, rockin'! Bash Artist George "E-Gor" Chastain! 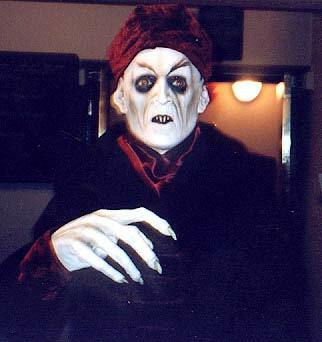 A mysterious Nosferatu roamed Monster Bash 1999. Monster Bash has brought you great guests like: Ben Chapman, Dolores Fuller, Jane Adams, Beverly Garland, Ray Harryhausen, Carla Laemmle, Forrest J Ackerman, Sara Karloff, Bela Lugosi Jr., Ron Chaney, Dwight D. Frye, Gary Don Rhodes, David Skal, Elena Verdugo, Tom Savini, Chilly Billy Cardille, Richard Valley, David Prowse, The Blob!, David "The Rock" Nelson, Conrad Brooks, Kyra Schon, Karl Hardman, Marilyn Eastman, Bill Hinzman, John Russo, Russ Streiner and many, many more to come!